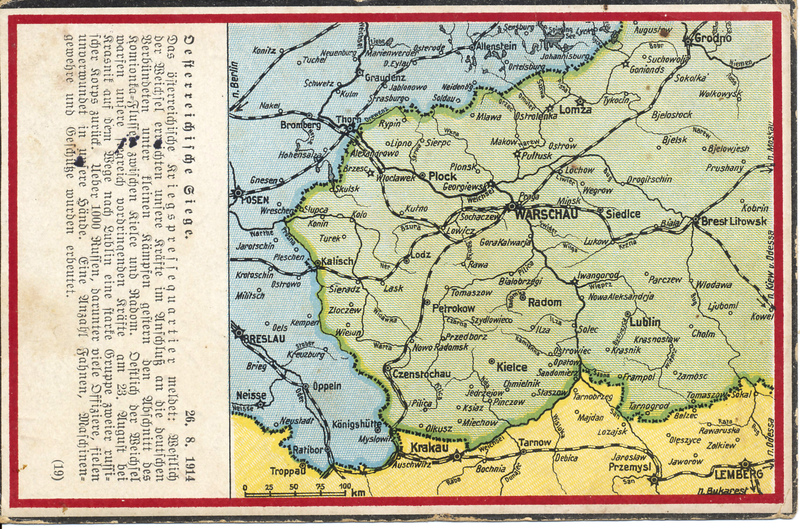 Postcard report and map of an Austrian victory at Krasnik on August 26, 1914. 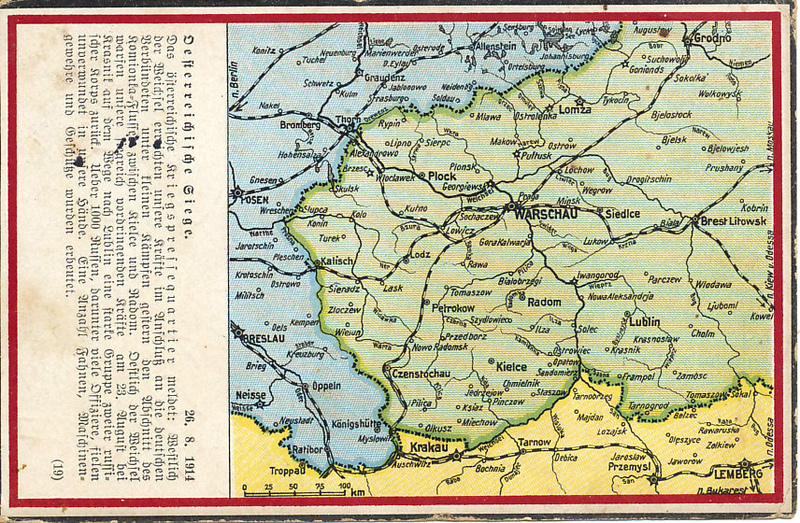 The three-day Battle of Krasnik, an Austro-Hungarian victory, began on August 23, 1914 when General Dankl leading the Austro-Hungarian First Army, advancing, struck the Russian Fourth Army, and drove them back towards Lublin. 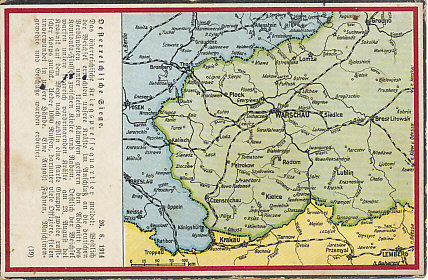 Russia is shown in green, Austria-Hungary yellow, and Germany blue. Message dated February 7, 1915. 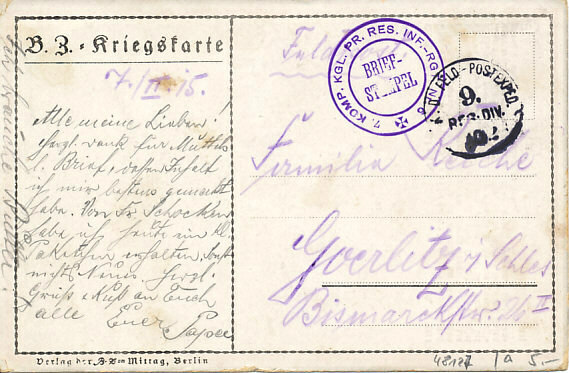 Field postmark 9 Res. Div. Victorious in the Battle of the Frontiers, five German armies advanced through northern France driving three French Armies and the British Expeditionary Force (BEF) before them. As the Allies retreated, French General Joffre reconfigured his forces, strengthening and extending his left, held by the BEF, creating the Sixth Army. The German offensive was weakened as troops were drawn off to besiege two French fortresses and the Belgian fortress of Antwerp. Commander von Moltke also sent two army corps east to aid the war against Russia. On August 26, one corps of the BEF fought the Battle of Le Cateau. On August 29, the Germans struck the French Fifth Army in the Battle of Guise. In both cases, the retreating Allies were dangerously isolated, and at peril of being outflanked. Joffre, seeking a line on which to stop the Germans, struggled to keep the British in the field, as British commander Sir John French considered retreating to the coast and Britain. Following its war plan, the First German Army advanced to the southwest to envelop Paris. On August 31, as the German Second Army stayed in position, the First Army commander, convinced the British had fled, and that he had no significant French forces on his right, turned to the southeast, advancing rapidly to envelop the French Fifth Army. On September 1, a 30-mile gap separated the two German armies. The French government fled Paris on September 2, giving command of the city's defense to General Gallieni. The new French Sixth Army retreated to the strongly fortified city. 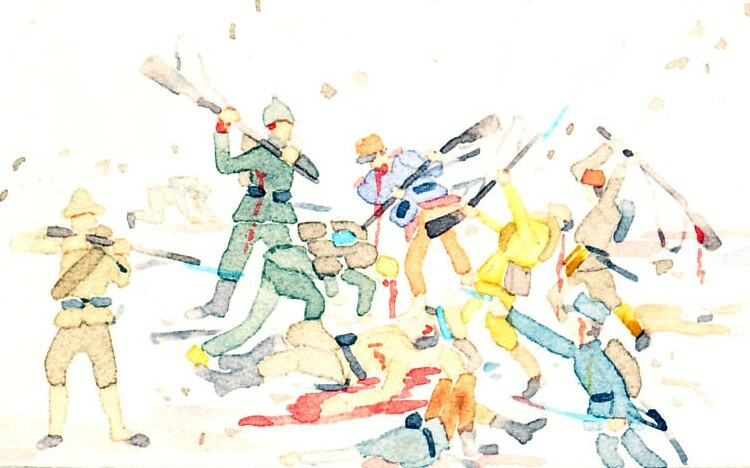 Joffre repeatedly asked his commanders when they would be ready to counter-attack. Franchet d’Esperey, new commander of the Fifth Army, would be ready on September 6. On September 5, German forces encountered the Sixth Army advancing from Paris, and realized their danger.